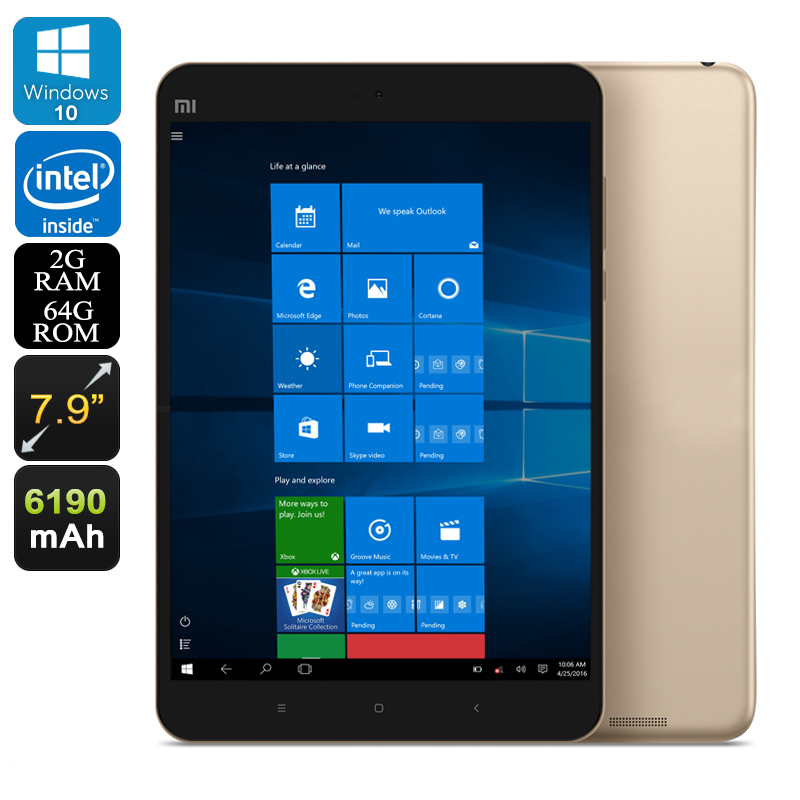 Successfully Added Xiaomi Mi Pad 2 Windows Tablet - Windows 10, Quad-Core CPU, 2GB RAM, OTG, Dual-Band Wi-Fi, 64GB Memory, 7.9-Inch Display (Gold) to your Shopping Cart. With this 64GB version of the Xiaomi Mi Pad2 you’ll be able to fill up your day with hour’s worth of mobile fun and entertainment. Running on a Windows 10 operating system, this mini tablet comes packed with all the classic and trusted features that Windows users are familiar with. A smooth and fast user experience is guaranteed with this operating system as it allows you to launch the most demanding of programs and applications within the blink of an eye. Additionally, this Windows tablet also supports OTG – further enhancing your overall user experience by letting you connect external hardware devices such as a hard drive or game console to your Mi Pad2. Although featuring a sleek and stylish design from the outside, this Windows 10 mini tablet packs some serious hardware. With its Intel Atom X5-Z8500 CPU, this Windows tablet PC allows you to play the most demanding games without dropping a frame. Built for speed, this 2.2GHz Quad-Core CPU handles the most demanding of situations without you ever needing to worry about slowing down your device. Additionally, the Xiaomi Mi Pad2 holds 2GB of RAM – letting you engage in the most demanding of multitasking sessions. With 64GB of internal storage, you can be assured that there will be enough space for you to save all your favorite files, games, and media alike. With its 7.9-Inch display that portraits all media in a stunning 2048x1536 (QXGA) resolution, you will be able to enjoy all your favorite movies and games to their absolute most. Added to that comes the tablet’s Intel HD Graphic Unit that supports vivid color and mesmerizing graphics – allowing you to enjoy a truly cinematic experience while watching a movie or engaging in the latest online games. Packing a massive 6190mAh battery, you’ll be able to enjoy all this beautiful Xiaomi mini tablet has to offer for hours in a row without ever needing to worry about running out of battery life. Supporting Dual-Band Wi-Fi connectivity, the Xiaomi Mi Pad2 allows you to browse the web and stream online movies at lightning speeds. Enjoy online games to the fullest, download files, and stream online movies in no time - with this Windows 10 tablet a laggy and slow internet connection will be an issue of the past. Additionally, its ultra-fast internet connectivity allows you to engage in smooth video calls with friends and family located at the other side of the globe as this mini tablet also packs a sophisticated 5MP front camera that’s perfect for video calls and snapping selfies. The Xiaomi Mi Pad2 comes with a 12 months warranty, brought to you by the leader in electronic devices as well as wholesale electronic gadgets..
Arabic: - 7.9 بوصة الكمبيوتر اللوحي - Chinese Simplified: - 7.9 英寸平板电脑 - Czech: - 7,9 palcový Tablet - Dutch: - 7.9 inch Tablet - French: - 7,9 pouces Tablet - German: - 7,9 Zoll Tablet - Hebrew: - 7.9 סנטימטר לוח - Hindi: - 7.9 इंच टैबलेट - Hungarian: - 7.9-lassan mászik Tabletta - Italian: - 7,9 pollici Tablet - Japanese: - 7.9 インチのタブレット - Korean: - 7.9 인치 태블릿 - Malay: - 7.9 inci Tablet - Norwegian Bokmål: - 7.9 tommers tavle - Romanian: - 7,9 inch Tablet - Russian: - 7.9 дюймовый планшет - Spanish: - 7,9 pulgadas Tablet - Thai: - แท็บเล็ต 7.9 นิ้ว - Turkish: - 7,9 inç Tablet - Vietnamese: - Máy tính bảng 7.9 inch.